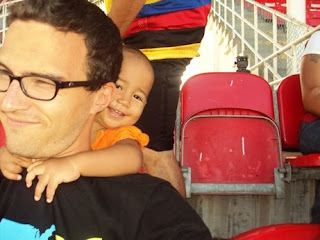 Wednesday night, Asolima texted me to invite me to come with my host family to watch a rugby game Friday afternoon. 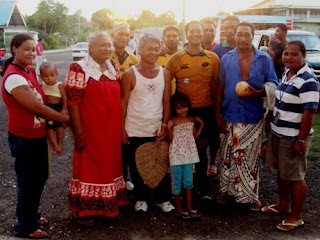 Though I live just a few blocks from Apia Park—from my house, I can hear the crowd cheering during big Toa Samoa games—I have never attended a rugby game, and since I wouldn’t be hanging out with Peace Corps until later in the evening, I figured why not? I sent a reply text expressing interest, and I didn’t hear anything about it. I shouted, “OU TE TAELE,” I’m in the shower. They found this hilarious. I finished in a rush, skipping some important parts (namely drying off), I threw on some clothes, and we were off. I was not clear how admission worked. We were able to drive through the gate on to the grounds to park. There are no more gates from there. Now that I think about it, we have been on some sort of guest list. 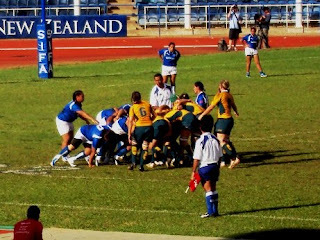 See, that was the whole reason we were there: my host mom Mele’s niece plays for the Australian Walleroos, which were in town to play the Samoan Manusina team. I didn’t hear about this until we were sitting in the grandstand and Asolima nudges my shoulder and says, “That’s my cousin,” pointing at some girl walking around taking pictures. “Cousin” can be a catchall for distant relatives who are approximately the same in age, but it turns out this was a real cousin. Asolima waived. The girl waived back. Girls’ rugby is pretty insane; I’m not sure we have any equivalent in The States. There’s the occasional news story about a girl who has broken down the barriers at her high school and joined the football team, but it’s pretty unheard of to see a field full of women tackling one another. And from what I could tell, they pulled no punches. It was a rough game. Sitting with Keleme and Akanese during the game was what I expected it would be. They squirmed and ran around. The baby fell down. Akanese spent the first period wiping her nose. There were plenty of empty seats in our section, and Akanese explored the upper part of stands. Much like American football, a higher vantage point allows a better perspective of the game, so I went and sat with her at the top for a while. 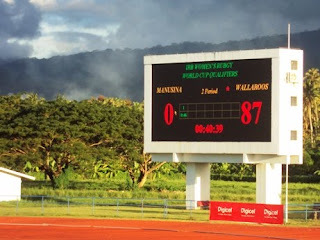 The Walleroos beat the Manusina 87 – 0. 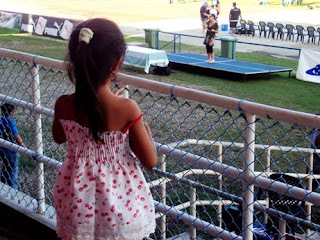 The Manusina kept their heads held high though, and each of the captains gave a little speech after the game. We went out to the parking lot after, and Asolima’s cousin came out to greet the family and take pictures and share hugs and kisses. There were tears. Oge brought out a large box of taro and breadfruit and luaao, which he gave to the cousin to bring back to Australia. And then it was time to go home. When they dropped me off at my house, I was also given a plate of taro and breadfruit and luaao. No tears were shed though. I hope you’re having fun. Pictures below. The family. Yeah. I know. We should have switch positions so I was taking the picture into the sun. But this is the way they lined up. Oh well. They baby was walking around in the row behind me. Occasionally strangling me. This was a little strange... That lady on the stage is some up and coming Australian singer who did a little performance before the game. But she sang "Torn," which was originally sung by Natalite Imbruglia circa 1998. Natalie Imbruglia is another Australian. I thought it was weird. 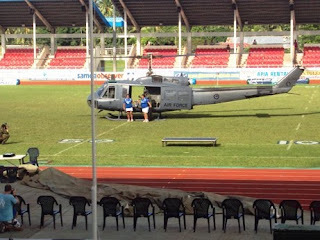 A New Zealand Air Force helicopter landed to deliver the trophy. Pretty elaborate. 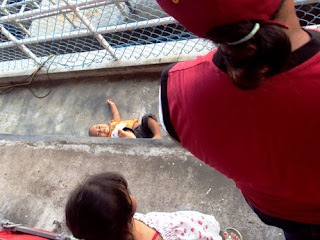 The baby laid on the ground during the national anthem. Nice win!!! Have a nice day. I love the picture of the baby's arms around your neck. Brad - it may surprise you to know that not only is women's and girls' rugby played in the USA, but they are one of the world's leading nations - and rather better than Australia (ho they have never lost to). They were even World Champions in the 1990s. Today they's rank about 4th or 5th in the world - Australia would be about 8th. Over a quarter of all rugby players in the States are women (compared to about 8% elsewhere) and they are playing over the next few weeks in a big 5 nation event in Canada (also involving England, South Africa, and France). The US also have a reputation of being very physical - much more so than the Australians or Samoans. I came here to say that I love the picture of the baby's arms around your neck. Stop trying to be me Mom!! Just kiddddding. The US were good at womens rugby in the 1990s. However, since then New Zealand and England are the two top teams in the world. New Zealand womens have won the world cup the last couple of times. However, the American womens team are no pushovers. They are still ranked very highly and one of the leading female teams in the world.